At Classfare, we believe there are particular categories of apparel that warrant extra investment, and outerwear is one of them. Whether the autumn climate in your neck of the woods entails wind, rain, or even snow, we’ve got you covered – and covered up. Everyone has a different philosophy of style, which is influenced by personal taste, identity, budget, and climate, among other things. Whereas some guys enjoy buying regularly to keep up on trends or simply to add new options to their closet, others curate their wardrobes tightly with a more minimal approach — investing in fewer, higher end classic pieces that they’ll wear for years to come. Regardless of your own bent, there are certain categories of apparel in which you should strongly consider investing a little more money. One such category is outerwear. Not only is it completely appropriate to wear the same jacket day after day, but outerwear ultimately serves the functional purpose of keeping you warm and dry. To do so well (and for the duration of several seasons), quality is much more than a value-add — it’s a requirement. To get such functionality and longevity, and to do so with style often carries a higher price tag. But the cost per wear will stack up strongly in your favor. With that in mind, we’ve selected our favorite of-the-season jackets: one for wind, one for rain, and one for heavier duty afflictions. Though the August heat continues, the changing of the seasons is nigh. Before you know it, you’ll be reaching for one of these in no time. Every guy should have a quality wool jacket. This rugged wool blazer from Apolis is constructed in California using a one-off indigo-dyed wool textile from Italy. It features a rounded collar, pocket flaps, and raglan shoulder, adding charm to an otherwise classic workwear silhouette. While it’s an investment, you’ll be wearing this jacket for well over a decade. When it comes to the classic navy wool jacket, we say buy nice or buy twice. Unless you live in the southwestern United States, it’s likely you’ll experience some amount of rainfall in the next several months (or nine). And it’s surprising how many jackets simply don’t fare well when they get wet (be it leaky seams or cheap fabric that slowly saturates under a good drizzle). 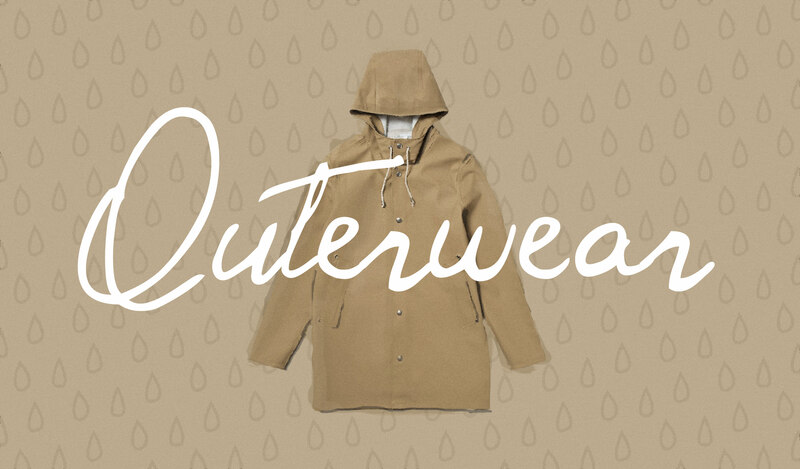 Enter swedish brand Stutterheim. When Mr. Alexander Stutterheim discovered his grandfather’s old raincoat in an abandoned barn, he was inspired to recreate the timeless style with a more modern cut and amenities, and the Stutterheim brand was born. The Stockholm jacket is one of our favorites. It features snap closures, double-welded seams, and has no separate lining — just thick, rubberized cotton. Each coat is individually quality-controlled by skilled seamstresses and will last through thick and thicker. This is the proper rain slicker at its best. When it comes to keeping dry and staying warm, you’ll need something a little more beefy. While there are plenty of great technical jackets on the market from major outdoor brands like North Face, Marmot, and Patagonia, we’re of the opinion that such jackets are best used when participating in the actual mountain activities for which they’re designed. When trekking to and from the office, something in a neutral color with a classic silhouette feels more appropriate, like this jacket by Fjallraven. This warm, versatile 4-in-1 jacket includes a waterproof outer shell with some extra length for covering your upper legs in rain and snow, while a detachable, reversible inner jacket provides insulation. The inner jacket can be used separately on warmer days and is reversible, depending on whether you want a smooth surface or a brushed one that doesn’t rustle as you move about.